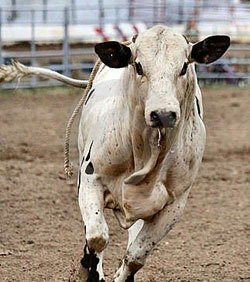 As the agitated Brahma bull rushed towards the crowd, I held my speech, and my breath. He was large, not by American bull standards, but large none-the-less. Larger enough to seriously hurt someone, large enough to scare away the young men I was talking to. But, not larger than God, and not larger than the importance of the message God had given me for these youth. I was standing on the edge of a well-used, well-worn soccer field in a little town of Guatemala. I was there with a team of Gringos, our mission to spread the Gospel of Jesus to an age group that hadn’t been targeted before in this area. About 30-40 teenage boys had come to the soccer camp we were hosting. As I was presenting the message I had worked so hard on, a cow came charging in the area where we had gathered. Close behind her was the aforementioned bull, bucking and snorting. She was fleeing him, he was chasing her. It couldn’t have come at a worse time in my message. Being a school teacher, I know how devastating a disruption can be to a lesson. This was no exception, or so I thought. Yes, the charging cattle were a major distraction, as you would expect. In fact, a flash of horror went through my mind as I envisioned the rowdy bull lowering his head, goring and stomping the group of boys and/or our team members. The mistake I made was thinking that my message was interrupted and that all was lost. I was wrong. Twelve boys received Christ as their Savior that day. The enemy tried to disrupt the working of the Holy Spirit in that moment, by sending a potentially dangerous situation. But God proved that He is greater than anything the devil can throw at Him. He protected us from the bull and He protected what He was doing in those boys’ hearts. My faith grew that day. I know He works miracles everyday. I know He brings victory everyday. I know He protects us everyday. And now I know He uses us to reach others everyday, despite the distractions that charge at us. And that’s no bull.